SOF News Update 20181130 – 5 non-kinetic CT efforts, update on death of Ranger in Afghanistan, podcast – hunting OBL, analysis of national strategy for CT, Peace Stability Journal, books on COIN, Russia-Ukraine conflict, investigation of SOF team in Afghanistan, AFRICOM in Somalia, Taliban strategy, CJTFOIR update, Hazaras under attack, the importance of Saudi Arabia, Turkey brief, foreign bases in Djibouti, and more. More on Death of Ranger in Afghanistan. Resolute Support HQs has released a news release that states SGT Leandro Jasso was accidentally shot by a member of the Afghan partner force. Afghan Commando Killed by US / Czech SOF? A 7th Special Forces team that was working with Czech SOF in Afghanistan has been pulled out of theater. There is an ongoing investigation on the death of an Afghan Commando who was in Coalition SOF custody and later released to Afghan security officials. The Commando died from blunt trauma caused by beatings on his body. The Commando was responsible for the death of a Czech SOF member in an insider attack on October 22nd in Herat, Afghanistan. Read more in “American and Czech SOF Under Investigation for Afghan Detainee Death”, Special Operations, November 28, 2018. AFSOF Officer Assignments. Col Stewart Hammons nominated for BG – currently serving as commander of the 27th Special Operations Wing. COL Benjamin Maitre nominated for BG – currently working legislative affairs in D.C. for USSOM. Col Claude Tudor nominated for BG – currently serving as commander of the 24th Special Operations Wing. Update on Nov 27th IED Strike that Killed 3 US SOF. It appears that the Pentagon couldn’t answer questions on the status of the US contractor who was wounded in the improvised explosive device attack that killed two 3rd Special Forces Group Green Berets and an Air Force Special Tactics airman in Ghazni, Afghanistan. At one point the contractor was reported as wounded and then as died of wounds. The Pentagon couldn’t quite figure it out. Seems they couldn’t call USFOR-A on the phone to get the answer. Taliban Strategy. Michael Semple says that despite the Taliban’s success on the battlefield during the 2018 fighting season there is little hope of an all-out victory for the insurgents as long as NATO continues to support the Afghan government. Read “The Taliban’s Battle Plan”, Foreign Affairs, November 28, 2018. Hazara Under Attack. The Taliban have pushed into traditional areas of Afghanistan where Hazara people constitute the majority of the population. In recent years these areas were left alone by the Taliban; so this is a big change. Read an analysis of the situation in a piece by the folks at Afghanistan Analysts Network (AAN), November 28, 2018. SFAC Activation. On Thursday, November 27th the Security Force Assistance Command was formally activated during a ceremony on Fort Bragg, North Carolina. General Milley, the Army Chief of Staff, was on hand. There was cake and the SFAC bubbas were wearing their swanky berets. 2nd SFAB Activation. 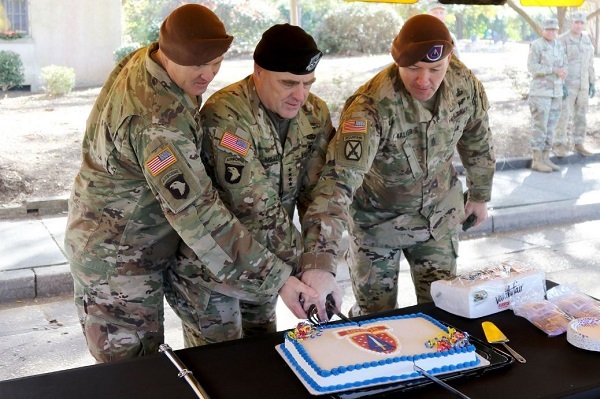 The 2nd Security Force Assistance Brigade was formally activation during a ceremony at Fort Bragg, North Carolina. The unit was established earlier in 2018. It has been selecting and training Soldiers to be Combat Advisor. The unit will deploy to Afghanistan in the spring of 2019. ‘Super Soldiers’ Study. The Center for a New American Security (CNAS) has completed a lengthy study on how to make soldiers better protected in the future while lessening the weight that they carry. Read the 7th and final report on this topic entitled Super Soldiers: Summary of Findings and Recommendations, CNAS, November 2018. Europe, NATO, Russia, . . . and Ukraine. Ukraine vs Russia. The Ukrainian government is asking NATO to deploy warships to the Black Sea and Sea of Azov. (ed note: the Sea of Azov is relatively shallow, most warships can’t go there). NATO seems to think it is doing enough. The Ukrainian seaports of Mariupol and Berdyansk are basically not functioning due to the Russian blockage of the Kerch Strait. President Trump has threatened to cancel the meeting with Putin at the G20 summit. (Editorial note: probably just as well that he doesn’t meet Putin based on what went on at the Helsinki Summit earlier in 2018). Blame the Russians. The confrontation over access to the Sea of Agoz between Ukraine and Russia continues. Russia sealed off the Sea of Agoz (international waters) and has announced that it is now an internal body of water belonging to Russia. Of course, this ignores the fact that Ukraine has a significant coastline on the Sea of Agoz. The U.S. State Department (belatedly) has finally released a statement on the incident. Read “Russian Aggression Against Ukraine”, DIPNOTE, November 27, 2018. Russians Massing on Ukraine Border. The spat over access to the Sea of Agoz could be growing into something a bit more serious. According to Ukrainian intelligence officials Russia is positioning aircraft, helicopters, and ground forces along and in the region of the Russian-Ukrainian border. Most observers say that Russia isn’t looking to sharply escalate the conflict in eastern Ukraine nor have a military confrontation with NATO. Russia is putting NATO on notice that things could get complicated if Ukraine becomes a member of NATO. In addition, using a form of incremental hybrid warfare, Russia (through the denial of access to the Sea of Agoz) is disrupting commercial traffic of Ukraine agricultural and industrial goods to international markets – thus damaging Ukraine’s economy, undermining the current government, and looking for a return of a pro-Russia Ukrainian leader. (Defense One, Nov 28, 2018). Helping Ukraine. A couple of national security writers, Luke Coffey and Alexis Mrachek, provide their ideas on how the United States and NATO can improve Ukraine’s maritime capability. (The Heritage Foundation, Nov 28, 2018). Russian Spetsnaz Cyber Warfare. The Russians are experimenting and perfecting their cyber warfare TTPs in the Ukraine. Aaron Brantly – a cyber policy fellow for the Army Cyber Institute at West Point and Colonel Liam Collins – a Special Forces officer and the director of the Modern War Institute at West Point provide us with an article about this topic. Read “A Bear of a Problem: Russian Special Forces Perfecting Their Cyber Capabilities”, Association of the United States Army, November 28, 2018. Why Saudi Arabia is Important. Brad Patty writes on the four crucial roles that KSA plays in an American-led world order. Read “The Strategic Role of Saudi Arabia”, Security Studies, October 16, 2018. Mike Pompeo, the U.S. Secretary of State weighs in on the topic as well with “The U.S.-Saudi Partnership Is Vital”, DIPNOTE, November 28, 2018. ISW Turkey Brief. The Institute for the Study of War provides an update Turkish politics and adventurism in Syria. (ISW, Nov 28, 2018). CJTF-OIR Update. A spokesperson for Combined Joint Task Force Operation Inherent Resolve (based in Baghdad, Iraq) provided an update on operations in Syria and Iraq. Along the border of Iraq and Syria Iraqi forces are continuing clearing operations against ISIS militants. Iraqi Security Forces (ISF) are also conducting operations against remnants of ISIS who have gone underground (now they are insurgents conducting guerrilla warfare and terrorist actions) in other parts of Iraq. In Syria, the Coalition continues to support the Syrian Democratic Front (SDF) with air and artillery strikes. ISIS is fortifying their positions and digging in for a protracted fight in Syria. Then lots of Q&A as well. Read the transcript from the November 27, 2018 teleconference. More US Airstrikes in Somalia. AFRICOM has announced yet another airstrike against al-Shabab fighters. This latest strike is the 36th since the beginning of the year. The air attacks are against al-Shabab militants, fighting positions, infrastructure, and equipment. Somalia AFRICOM’s Main Effort? Africa Command seems to be expending a lot of resources and energy on Somalia. Regular airstrikes are taking place, SOF troops are serving on the front lines as advisors to government forces, the head of AFRICOM just visited the country. Read “AFRICOM boss travels to Somalia for high-level talks”, Stars and Stripes, November 28, 2018. Foreign Bases in Djibouti. The U.S., French, Italians, Japanese, and Chinese all have military bases in the small African country of Djibouti (I spent six months there with SOCCE-HOA). In addition, Germany and Spain maintain troops at the French base. This sets up environment for lots of intrigue (and espionage?). Read more in “Djibouti: the Casablanca of a new Cold War”, Asia Times, November 28, 2018. China Stepping Up. China is ready to spread its military around the world . . . taking a leading role in United Nation peacekeeping activities. Read “China says 8,000-strong UN peacekeeping standby force ready”, The Washington Post, November 29, 2018. Chinese Espionage. China’s Ministry of State Security (MSS) has been busy lately. In October 2018 the U.S. Department of Justice announced the indictment of 10 Chinese intelligence officers and cyber hackers from the MSS. Since 2000 there have been 274 documented cases of Chinese espionage worldwide. Nicholas Eftimiades, a lecturer at Penn State University’s Homeland Security Program (after 34 years of government service in CIA, DIA, and DoS) tells us all about it in “Uncovering Chinese Espionage in the US”, The Diplomat, November 28, 2018. Nagata on Non-Kinetic CT. The Director of Strategic Operational Planning at the National Counterterrorism Center – LTG Michael Nagata (a former SF officer) – has provided us with with a guide to “. . . strengthen our emphasis and resourcing on non-kinetic counterterrorism (CT) efforts . . .” He presents “Where we have been”, “Where we are now”, and “Where we should go”. As part of the ‘go’ he provides us with five non-kinetic counterterrorism efforts. Read “The Fight So Far”, PRISM, Volume 7, no. 4, November 8, 2018. Analysis of WH CT Strategy. Jessica Trisko Darden, a fellow at the American Enterprise Institute (AEI), provides an analysis of President Trump’s new National Strategy for Counterterrorism with a focus on Southeast Asia. (AEI, Nov 26, 2018). Podcast – Hunting OBL. Historian Vince Houghton sat down with DIA Chief Historian Greg Elder to discuss the DIA’s role in the hunt for Usama bin Laden. Listen to the 53-minute long podcast presented by SpyCast of the Spy Museum, October 30, 2018. Books on COIN. Max Brooks has compiled a listing of books on insurgencies and counterinsurgenices. Read “War Books: Building a Counterinsurgency Library”, Modern War Institute at West Point, November 26, 2018. Video – Air Base 201. The U.S. Air Force is constructing a big base in Niger. That involves a lot of moving parts to include units charged with security and base defense. Watch a one-minute video about the 824th Expeditionary Base Defense Squadron at Air Base 201. (435th AEW PA DVIDS, Nov 28, 2018). Video – Indo-Pacom Cdr Talks about China. Navy Admiral Philip Davidson, the commander of U.S. Indo-Pacific Command delivers the keynote address at the Center for Strategic and International Studies 3rd Annual China Power Conference in Washington, D.C. on November 29, 2018. (43 minutes). Video – SFAS. A recent graduate of the Special Forces Assessment and Selection course talks about his experience in this one minute video. (DoD, Nov 2018). Video – Best Warrior Competition. SFC Sean Acosta, an instructor with the U.S. Army JFK Special Warfare Center and School, won the 2018 competition. He is interviewed in two one-minute long videos about the competition. 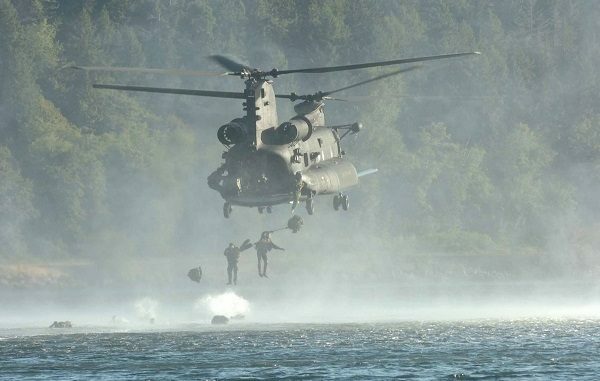 Photo: 1st Special Forces Group Soldiers helicast from a 4th Battalion, 160th Special Operations Air Regiment (SOAR) helicopter near Joint Base Lewis-McChord, Washington.